Sorry, this unit has been discontinued and is no longer available for purchase, replace by Firebox T30, T30-W, T50, T50-W . You can also purchase available renewals below. End of Life for the XTM 33 Wireless is 01 Jul 2021 - you will not be able receive support after this date even with a 1 Year contract. 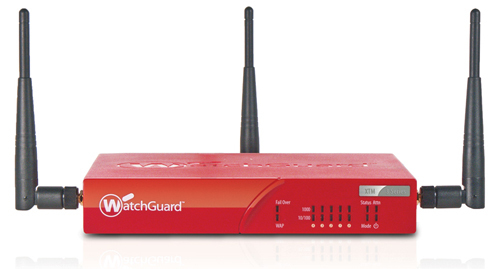 Introducing the WatchGuard XTM 3 Series! The newest member of the XTM family is a powerhouse performer for small businesses that want next-generation security features and fast firewall/VPN throughput at a small-business price. The XTM 3 Series appliances include a suite of flexible management tools to give small businesses the tools they need to stay on top of network activity. They also include the Pro version of Fireware XTM operating system for advanced networking features, including VLAN support, multi-WAN load balancing, and dynamic routing. Real-time monitoring and rich reporting are included at no extra cost. The XTM 3 Series provides up to 1.4 Gbps firewall throughput, 240 Mbps VPN throughput, and up to seven 1-Gigabit Ethernet ports to support high-speed LAN backbone infrastructures and gigabit WAN connections. WatchGuard offers six security subscriptions for its next-generation XTM 3 Series solution, so businesses can build up protection where they need it most. Subscriptions can be purchased individually or bundled together for even greater savings. Nothing could be easier than our drag-and-drop Branch Office VPN setup - three clicks and your remote office is connected. Choose to use the management tool that suits your work style and the task at hand. Options include our feature-rich intuitive centralized console, a command line interface, or web UI for access from anywhere, anytime. The Pro version of our Fireware XTM OS is included with purchase for advanced networking features like policy-based routing, dynamic routing, multi-WAN load balancing, and VLAN support. Includes SSL and IPSec VPN for flexibility in remote access, with support for Apple iOS devices such as the iPhone, iPad, and IPod touch. Monitoring and reporting tools, included at no extra cost, support industry and regulatory compliance with drill-down functions that make it easy to pinpoint specific activities. Add a simple subscription to Reputation Enabled Defense to your XTM solution and your organization will have faster web performance and even stronger security - with no additional hardware to buy. Our firewalls are designed with efficiency in mind, consuming very little energy. Compare our power consumption to other security products and see how WatchGuard can make your data center more energy efficient. Green up your network with WatchGuard. WatchGuard Dimension, a public and private cloud-ready visibility solution, instantly turns raw data into security intelligence. Firewall throughput of up to 1.4 Gbps and UTM throughput of up to 298 Mbps to keep traffic moving. Gigabit Ethernet ports support high-speed LAN backbone infrastructures & gigabit WAN connections. The XTM 33-W is a wireless model that includes optional dual-band 802.11/n technology for much more responsive wireless network connection and expanded range. Allows users to access 2.4 GHz or less crowded 5 GHz band. Multiple security zones give administrators precise control over Internet access privileges for different user groups. **Server load balancing is not available for XTM 3 Series appliances. Ideal For Remote offices, small businesses that need an easy-to-manage solution at a great price. Available in wired and wireless models. Small businesses that want the next-generation of network security combined with fast throughput and advanced networking features. Optional Centralized (Multibox) Management. Optional licenses enable Drag and Drop VPN and one-touch appliance updates. 4-device WatchGuard System Manager license included with purchase. 4-device WatchGuard System Manager license included with purchase. * Concurrent sessions here represent the number of bi-directional connections. ** Throughput rates will vary based on environment & configuration. Download the WatchGuard XTM 3 Series Datasheet (PDF).